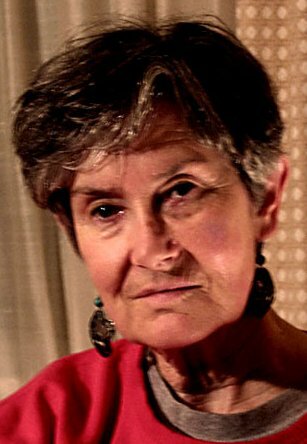 Marie Campbell is a retired University of Victoria professor who left on December 12, 2002 to spend a month in Palestine doing observational work with the International Solidarity Movement (ISM). Observers from Europe and North America act not only as witnesses, but also provide a measure of protection and emotional support to Palestinians. I got out of Jerusalem by bus and back to the home of my benefactors, Danny and Raquel Tadmorr (who deserve to be mentioned in my dispatches for their wonderful support) in Tel Aviv. I am now going to enjoy a bath and change into the clothes that I left in their house while I was in Palestine. I still have work to do before I leave here tonight. I forget whether or how much of the story of the “Jayyous woman detained” I have told you. My ISM group decided that we had to try hard to get this event publicized and responded to by Israelis. We felt that we needed to respond to the anguish that the villagers felt about having this young mother taken away from her family and especially from her nursing baby without any sort of “charge” against her. The villagers saw it as the “raising of the bar”, as far as harassment goes, and they thought that once the army starts to take women, they will continue. So I have been working in Jerusalem to find a feminist or peace group to take up the cause – just a simple request, to circulate my statement about the problem and ask Israelis to call the people’s names we are putting at the bottom the statement, names of government and military leaders. I have been talking to Bat Shalom, over the past few days, and to several feminist members of the Kenesset, known to be supportive of the cause of peace, and to Betselem, a human rights group. All find that our idea for action on this issue, while not a bad one, is not exactly in their mandate. I still have to contact, Gush Shalom. I hate so much to leave here without ensuring that the thing gets into the hands of someone who will carry it forward. Wish me luck on this. I am bringing home three newspapers that I picked up in Jerusalem today. It’s interesting to see three different versions of events. I see a new undertaking emerging for Marie, the Sociologist of Knowledge. Who would like to join me in reading Canadian newspapers, and analyzing and responding to the Middle-East stories that appear? In discussion with a Palestinian professor (Rita Giocamen) from Beirzet University in Romallah (Monday of this week), this emerged as one of the possible ways to influence Canadian public opinion, and one that I might be able to carry out with the help of other interested people. We talked about other avenues of continued support for the cause of Palestinian-Israeli peace, which I will speak about when I come home. I am looking forward to coming home and seeing all my friends.